Mary Ellen O’Toole calls the teenagers who murdered 13 people at Columbine High School in 1999 by their first names — Dylan and Eric. O’Toole did not personally know Dylan Klebold and Eric Harris, but she’s thought about them for decades. At the time of the Colorado shootings, O’Toole was a profiler for the FBI and had been tapped to write the bureau’s report on how to prevent mass shootings in schools. What began as a research project has become a life’s work — and a deep source of frustration. It’s difficult to say definitively how many school shootings have happened in the years since Columbine — or in the years before it. It’s harder still to prove how many would-be shootings were averted, or how many others could have been if additional steps had been taken. But the people who have spent the last two decades trying to understand this phenomenon are still here, and still trying to sell politicians and the public on possible solutions that are complicated, expensive and tough to sum up in a sound bite. Any research into school shootings is made more difficult by how uncommon such shootings are. In 2016, FiveThirtyEight wrote about the more than 33,000 people killed by guns in America every year. Of those deaths, roughly one-third — about 12,000 — are homicides, but hardly any are due to mass shootings.1 If you define mass shootings as as an event where a lone attacker indiscriminately kills four or more people, in a public place, unrelated gang activity or robbery, then mass shootings account for a tiny portion of all gun homicides — probably a fraction of a percent. There have been many attempts to formally quantify school shootings, but, as with mass shootings, all use different definitions. Our chart is taken from a 2016 paper that defined a school shooting as a premeditated incident of gun violence that took place in an educational setting, killed or wounded at least three victims (not counting the perpetrator), was unrelated to gang activity and was not an act of domestic violence.2 This data suggests that school shootings, though still extremely rare, are more common today than they were 40 years ago. These uncommon but high-profile tragedies had also drawn the attention of Marisa Randazzo. In 1999, she was the chief psychologist for the Secret Service and became a part of a joint effort between the Secret Service and Department of Education to better understand school shooters and how to prevent attacks before they happened. Randazzo had previously worked on the Exceptional Case Study Project — a Secret Service project designed to better understand people who threaten the president and other public figures. Like school shootings, assassinations are extremely rare events that have a huge impact on society. That rarity makes them hard to study — and makes it hard to tell blowhards from real threats. But their impact makes them important to understand. Randazzo found that the project’s findings echoed what she was learning about school shootings. For instance, the Secret Service had once focused its energy on threats made by people with a history of violent crime or who had a mental illness that caused them to act irrationally. But the Exceptional Case Study Project analysis showed that most people who actually carry out attacks didn’t meet either of those criteria. Instead, a better way to figure out who was a really a threat was to talk to friends, family and coworkers — most attackers had discussed their plans with other people. Randazzo and O’Toole’s parallel reports came to remarkably similar conclusions. First, these studies determined that there wasn’t much point in trying to profile school shooters. Yes, most were (and remain) male and white, but those categories were so broad that they’re essentially useless in identifying potential threats ahead of time, Randazzo said. What’s more, she said, more detailed profiles risked stigmatizing perfectly reasonable behaviors — like wearing wearing black and listening to loud music. Instead, the reports focused on the behavior and mental state of the young people who chose to kill. While these teens were deeply troubled, that’s not quite the same thing as saying that those who commit school shootings are just irredeemably mentally ill. Nor does it mean those young people suddenly snapped, giving no warning. “School shooters typically do this out of a profound adolescent crisis,” said James Garbarino, a professor of psychology at Loyola University who specializes in teen violence and began studying school shooters in the late 1990s. Randazzo described a pattern of young people who were deeply depressed, unable to cope with their lives, who saw no other way out of a bad situation. The stressors they faced wouldn’t necessarily be problems that an adult would see as especially traumatic, but these young people were unable to handle their emotions, sadness and anger, and they started acting in ways that were, essentially, suicidal. Some of the best data on the mental state of school shooters has come from interviews with those shooters (and would-be shooters) who survived the attack. Randazzo described one such living school shooter,3 currently serving multiple life sentences, who told her that before the attack he spent weeks vacillating between suicide and homicide. Only after he tried and failed to kill himself did he settle on killing others in hopes that someone would kill him. Garbarino, who has interviewed dozens of people who went to prison for life as teenagers, both for school shootings and other violent crimes, heard many similar stories. “The reason I emphasize this is that we know so much about how to help someone who is suicidal, and those same resources can be used very effectively with someone who is planning to engage in school violence,” Randazzo said. So how do we spot the ones who are planning an attack at a school? The studies she and O’Toole published years ago showed that, like people planning to attack the president, would-be school shooters don’t keep their plans to themselves. They tell friends or even teachers that they want to kill. They talk about their anger and their suicidality. And as more teens have attacked their schoolmates, that pattern has proved to hold true over time. It was true for Nikolas Cruz, the Parkland shooter. It was true for the at least four potential school shootings that were averted in the weeks after Parkland — all stopped because the would-be killers spoke or wrote about their plans and someone told law enforcement. While all the experts I spoke with said that policies that keep guns out of the hands of teenagers are an important part of preventing mass shootings, they all also said it was crucial to set up systems that spot teens who are are struggling and may become dangerous. But those systems seem to break down over time. Randazzo told me that her team had trained numerous school districts in school shooting prevention back in the early 2000s and, as of this year, many of those districts no longer had prevention systems in place. Thanks to staff turnover and budget reprioritization, that institutional knowledge simply withered away. And ironically, that happens precisely because school shootings are so rare. “It takes time and effort for a school to create a team and get training,” Randazzo said. “And, fortunately, threatening behavior doesn’t happen often enough” to spur schools to action. Our data on total gun deaths and gun homicides was drawn from the Centers for Disease Control and Prevention and represents the average of the years 2012-2014. There is not a single definition of what constitutes a mass shooting. To count those, we have chosen to use the definition and database put together by Mother Jones, because it was recommended by experts I spoke to and because it does a good job of distinguishing between a mass shooting as we understand it in the colloquial/pop culture sense and other kinds of shootings that, while tragic, don’t fit the narrative we’re trying to focus on here. But there is no one right answer for how to quantify this. 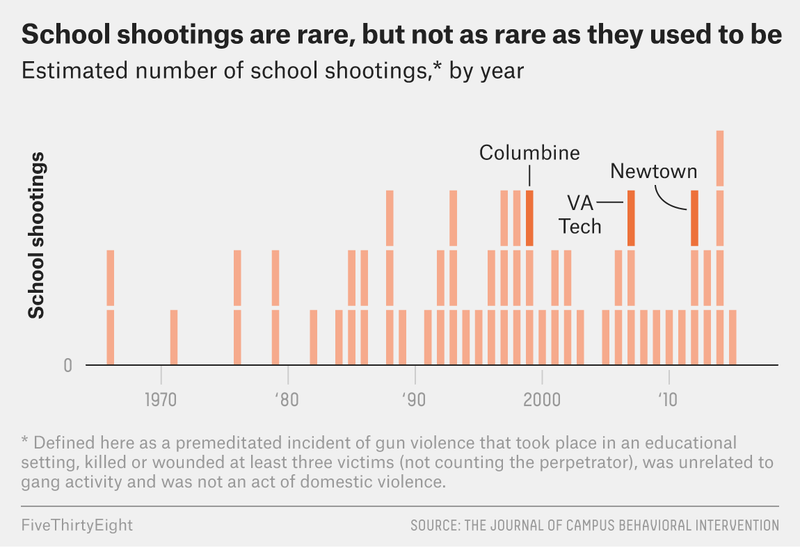 Some analyses of school shootings are limited to incidents where the perpetrator is an adolescent or the shooting takes place in a primary or secondary school, criteria that exclude events like the Virginia Tech shooting. This paper includes incidents that occurred at colleges or involved adult perpetrators, resulting in a larger total number of school shootings in its data set than in some similar data sets. Randazzo declined to say who she was referring to.